While reading China Digital Times today, I found an interesting article about smoking in China. I have a growing collection of “smoking” photos so I thought I would put this together. A recent US study has suggested that more than 80 million people in China will die in the next 25 years as a result of lung disease. The study focused on the devastating impact of smoking and the widespread practice of burning wood or coal at home for cooking and heating. The sad part? Research suggests that the vast majority of the deaths could be prevented. A BBC article cites the study as saying “one in three cigarettes lit in the world is smoked in China”. It is definitely one of the first things I noticed about China. Cigarettes are everywhere. 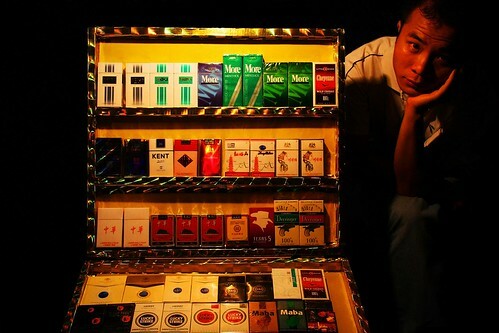 On every street in my neighborhood, every street in Liuzhou, you will find a place to buy a pack of smokes. China is the world’s largest producer of cigarettes, supplying 1.79 trillion a year. The Daily Evergreen, says “more than 100,000 die every year in China as a result of passive smoking“! China Daily adds, that “each year in China, the deaths of 1.2 million people are associated with smoking. 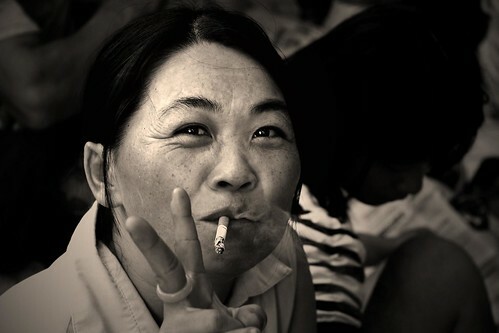 Some smoking-related chronic non-communicable diseases, such as lung cancer and hypertension, have become a main health problem because little attention has been paid to the hazards of smoking and passive smoking.” Here in Liuzhou, I see little regard for others by the legions of smokers. Restaurants, elevators, trains, public buses, even hospital waiting rooms are not immune. The little girl below is hanging out at her father’s street-side cigarette and booze stall, just one of thousands like it in Liuzhou. Yes, I wrote thousands. The amount of young people, and I mean even very young boys I see smoking is staggering. I even see Physical Education majors at my college smoking on campus. A 2007 survey of Chinese physicians reported in Medical News Today indicated that medical assistance in quitting smoking may not be that easy to find for smokers either. Researchers found that 23 percent of 3,552 hospital-based physicians surveyed were smokers! The findings are noteworthy because physicians who smoke are significantly less likely than their non-smoking counterparts to advise their patients to quit smoking. As a result of this survey, the China Center for Disease Control has instituted an anti-smoking campaign that targets physicians and medical students and promotes smoke-free hospitals. Let’s hope it has some effect. I had a bout of kidney stones in July and my urologist frequently walked rounds clinching a filtered Panda between his teeth. Smoking rates in other parts of the world continue to decrease, but here in China there is no widespread smoking ban in place. There is no advertising restriction, no taxation and very little effective anti-smoking health education. You thought tobacco was big business in the US? Take a look at some of those numbers again. 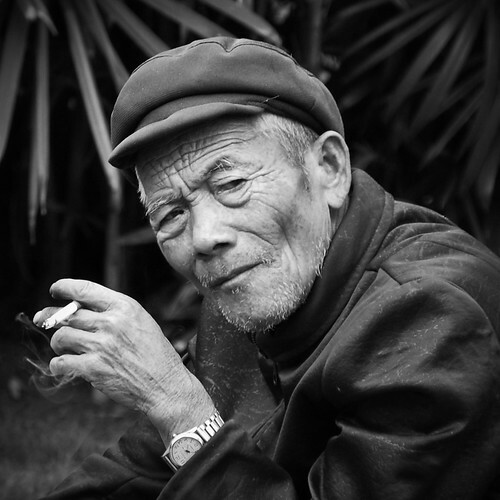 57 percent of the Chinese male population smokes. 1.79 TRILLION cigarettes are manufactured in China each year and that number is going up. 100,000 die each year as a result of passive smoking! 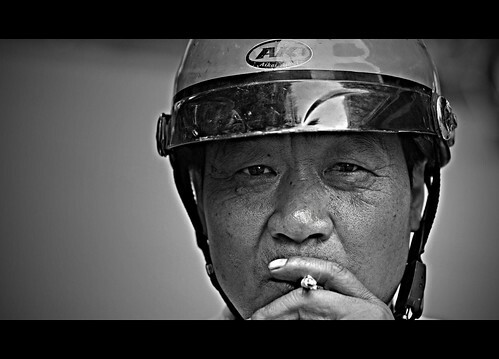 As many as 23 percent of physicians in China are smokers! Anyway, like I said, it’s one of the things I really noticed when I first came to China. It’s a cool, cloudy Sunday morning here, the last day of my National Day holiday. I’ll run out to do some errands after my morning coffee and cigarette. Oh, before I forget. O.J. Simpson went bust in Vegas. His luck finally ran out 13 years to the day after being acquitted for the murders of Nicole Simpson and Ronald Goldman. He got nailed for a stupid armed robbery he and a gang of thugs committed while attempting to get back some sports memorabilia that Simpson claimed had been stolen from him. A Las Vegas jury didn’t buy it and convicted Simpson on 12 counts. He faces the possibility of life in prison. At 61, it’s more realistic that he’ll get around 20 years. A valuable lesson for all of us, in America it’s easier to get away with murder than it is to steal sports memorabilia. ~ by Expatriate Games on October 5, 2008. As bad as the smoking problem is in China these days, it was worse in the past. Until the mid ’80s people were allowed to smoke in department stores, theaters and elevators. It is now prohibited in those places, and in department stores the prohibition is even enforced. If the Chinese authorities continue to make progress at the same rate as they have over the last 30 years, the problem may be resolved in two or three hundred years. Regarding OJ, a “claim of right” defense is a loser from the get-go. A good faith belief that you are the owner of property in the possession of another does not give you the right to take the property by force. (The only acceptable way to get the property back is to file a lawsuit or other legal process.) OJ’s lawyers apparently hoped to convince the jury that he didn’t take the property “by force” — that the five football-player types, at least one of whom was armed, were just making a polite request for return of the property. Goldman’s father says his civil lawsuit and relentless pursuit of OJ’s assets over the years brought about OJ’s downfall. OJ couldn’t use legal process to get the property back, because Goldman would have intervened and taken the stuff, which forced OJ to take the law in his own hands. I don’t think this is a shining example of American justice at work. By the way, Michael, when I get your posts by email, the bold-face words come through as white and can’t be seen on the white background (unless I highlight them). I am the elevator “enforcement” in my building. I heard the security guards talking about it one day, apparently I have a reputation as an anti-smoking Nazi. Thanks for the O.J. insight, I hadn’t heard or read about Goldman’s claim. He may have a point, but end the end I think O.J. was his own worst enemy. Talk about a guy making some bad choices, he is up their on the all-time list. In the way of introduction, Jim (above comment) is a retired attorney who has been coming to and, for large chunks of time, living in China since the government first re-opened the place to foreigners. Thanks Jim, I’ll do something about the font colors on those highlighted words, I hadn’t realized it was coming through like that. Okay Michael, so I’m slow on the upswing. Comments do indeed work. Power to the people and such LOL. I look forward to reading this regularly. Fascinating stuff. I am always amused when I receive a comment like this, I usually just delete them but have recently decided to let folks show their ignorance. Stupid news Anonymous? What then, does that make your in depth and insightful comment? It’s a serious issue here. I mean, have something to say, else why bother?